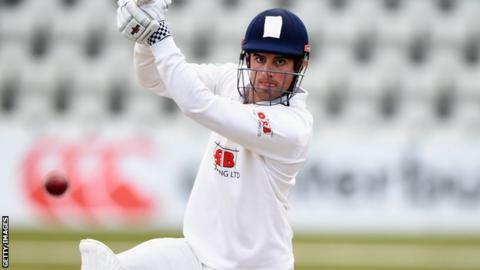 England Test captain Alastair Cook has signed a new contract at Essex. The 31-year-old has agreed a two-year deal with the county he made his first-class debut for back in 2003. Cook has scored 523 runs in Essex's first four matches of this season, including three centuries, as he prepares to lead England in their Test series with Sri Lanka later this month. He has played 79 first-class matches for Essex, but featured just six times in 2014 and 2015. "It's great to sign with Essex for another couple of years and I believe there are exciting times ahead for the club under the new head coach," Cook said. "I've been at Essex for all of my career and I hope to continue playing here for as long as possible." Essex are currently 21 points clear at the top of Division Two with Cook appearing in every County Championship game so far. However, he is unlikely to be available for much of the summer, with England playing seven Test matches against Sri Lanka and Pakistan. "It has been great to have him around the club, especially the experience he passes on to younger members of the squad during training on a day-to-day basis," said Essex head coach Chris Silverwood. "We know his England commitments take up a vast amount of the season but when available he has shown how he can further strengthen our batting line-up, and it's great he will be with the club for another two years."